How do you avoid hiring a coach who won’t do more harm than good? The short answer: very carefully. The longer answer is that there are a number of characteristics which, when you complete the tally, add up to a solid business coach. 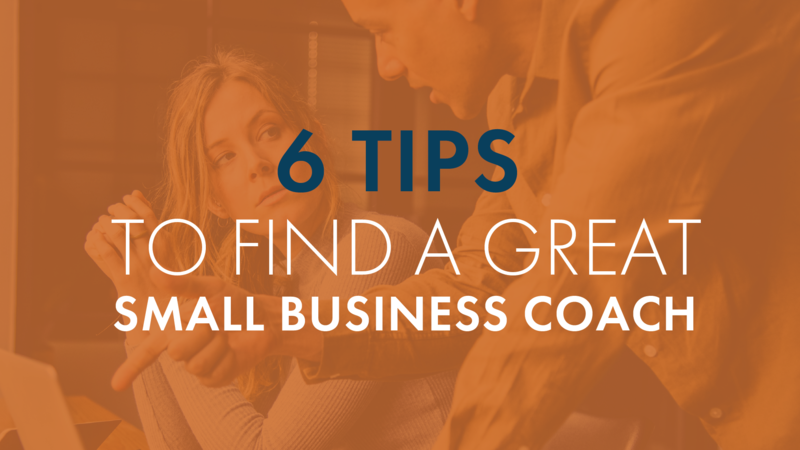 We’ve put together a list of 6 tips to help you hire a great small business coach. Small business coaching is a general term with broad meanings, so look for a coach with experience in your particular industry. Preferably, someone who knows your business model well. If you’re hiring a coach with a heavy background in the international import business and you’re a small dental practice, even if the coach is a titan of industry their advice and experience aren’t going to be of much use to you. The basic gist is that very few (if any) coaches have a skill set broad enough to adequately address your specific issue. You want to be sure your coach has specific, real-life experience in your area of business. You’ll need to get crystal clear about what problem you’re trying to solve before hiring a small business coach. Are you struggling with IT and business systems administration issues? If so, you’ll need a coach with substantial tech experience. Are you trying to enhance your management skills? It would benefit you to hire a coach with a background in leadership training. If you’re looking for help with conflict resolution in the workplace, you might search for a coach with expertise in conflict resolution. If you aren’t 100% clear about the problem you need to resolve, you can’t hire a coach that can help you solve it. Once you’ve targeted the problem you’re trying to solve and have effectively communicated that to a potential small business coach, they should be able to walk you through a detailed vision for their plan to get you where you want to go. You should get a sense that they can draw a roadmap with specific, structured, actionable steps to help clients reach an end goal. You also want to ask them what kind of accountability plan they can put together for you. Let’s face it— most of us have, at one time or another, procrastinated on an important project because we haven’t been given a deadline. It’s not enough for a coach to make suggestions and give advice. They’ve got to have a plan in place to ensure clients are accountable for their actions and assignments. At the outset, it’s important to set reasonable expectations for what kind of coaching style will get the best results for you. If you’re a type A personality, you’re probably going to tear your hair out with a right-brained, laissez-faire type of coach. A trusted friend or business associate who knows you well can likely speak to whether a coach’s personality might be a good fit or rub you the wrong way. And although we strongly advise that you use a coach who will be honest with you—even if the truth is tough to swallow— you should consider what kind of communication style is most effective for you. Do you respond best to a direct, no-nonsense delivery or do you prefer a softer touch? Personality types and communication styles are important because trust plays a big role when it comes to coaching. In coaching sessions, you may need to be brutally honest with yourself and talk frankly about your weaknesses. You probably won’t do that if you’re feeling defensive or shut down. Consider whether there might be any conflict of interest before hiring a coach. For example, if you hire a former employee who still has a vested interest in the company, or someone with strong ties to a particular vendor, those connections could get in the way of effective coaching. The former employee may have a personal beef with one of your key managers, so his or her staffing recommendations may be suspect. It’s hard to know whether a coach might be a good fit for you if you haven’t seen them in action. Many coaches now offer things like free or reasonably priced workshops where you can see them speaking and answering questions and get a better idea of how experienced and knowledgeable they are. Some coaches get permission from existing clients to record their calls, and then post the calls to a podcast so others can listen to the advice. Other coaches are frequent keynote speakers, so ask if they’ve got any YouTube videos you can look up. Another good question to ask is whether they’ve been published anywhere. A reputable coach will welcome inquiries. If they balk, it may be a good indicator they’re not comfortable with the level of their own expertise (and can’t back it up either). Finding a great small business coach can be the best decision you ever make. Just be sure to do your research. A small business coach should be perceptive, diplomatic, experienced and honest, and should be able to navigate conflict with integrity and good judgment. They should ask penetrating questions and be able to suss out problems of which you weren’t even aware. With effort and time, you can find the right coach for you and your business. The small business coaches at Ascension CPA are especially good at helping businesses figure out why their financial metrics aren’t performing as expected, making good decisions related to business financing, and making business operations more efficient.